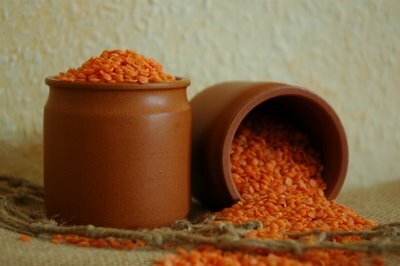 What did I make with these great looking lentils? Vaishali already knew what I was making here, because we were chatting on the phone while I was making this recipe. The phone rang and her lovely voice filled my ears. It was the first time we talked on the phone and I thank her for taking the initiative! Another person that got a sneak preview of what I was making was Pam as just prior to Vaishali calling me, we were chatting via MSN Messenger and I had just taken the first 2 shots for this post. Well this post will really go down into my memory as one of the best. It is proof of how great blogging is. Never can one imagine that by food blogging you meet people who become more than the usual anonymous face on the internet. By the time I did the write up for this post , I was also chatting to the lovely Nandita via MSN Messenger. The people I am getting to know through this hobby are amazing and I am just basking in the rays of their warm friendship. Let's keep it up folks! So, the real reason I made this dish was for Cate's ARF/5-A-Day Tuesday! This time with a little twist: We had to present a dish from another blogger. I don't know about you guys but this happens to me often. I get a job assignment and am so excited about it that I can't wait to start it. The ideas are pouring out and you actually have all the information at your fingertips. Then you sit down to try and sort your thoughts out. Once you get to this phase you start to feel deflated! There is so much information there that you just don't know where to start. That's how felt with this assignment from Cate. I have been collecting so many recipes from many of my favorite bloggers that my bookmark section in my browser looks completely chaotic. Even though I am very careful to sort them properly I just had too many recipes that I wanted to make. AHHHHRGHHH! I really took the entire weekend to think about this one. I made a new bookmark section called "Consider for Cate's" and started adding the bookmarked recipes to this bookmarked folder! One by one, checking and re-checking, deleting and pondering. I finally came down with the last three. You know what? I cannot even remember the actual reason I finally decided to go with Shammi's Vegetable Daal. I just thought the lentils will look good in a picture with the set up you see here and all those vegetables will make such a nourishing dinner. Well it was to be the Vegetable Daal! However, once I started to cook this my fantasy took control and after a first read of the instructions I put it down and started going with my own flow. I guess, we can say that I adapted Shammi's recipe. 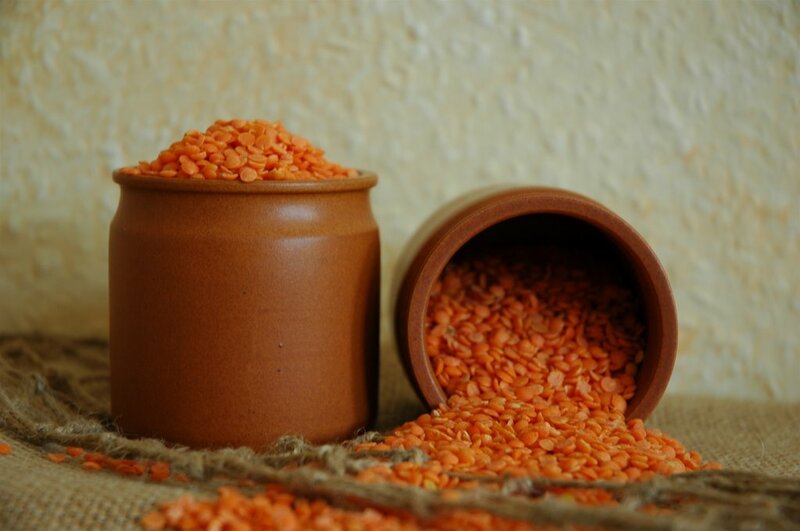 200g lentils - I used only one type - masoor daal or red lentils. But you can use a variety of three as in the original recipe. 2 teaspoons garam masala powder - you can also make your own from the original recipe, but I decided to go for the ready made stuff. Cook the lentils with the vegetable stock and the bay leaf in a pressure cooker. Cook only till the lentils slightly soft. Open and gently boil further. Add the frozen spinach and cook further. In the meantime put the "hard" diced vegetables (carrots, kohlrabi, potato) in a bowl with water and nuke it for approx 7 minutes. In a wok heat up some oil and add the onions, garlic, garam masala and ginger paste. Cook for a few minutes until all the aroma has unfolded - approx. 10 minutes. Add the chopped tomatoes and cook for a further few minutes. Throw in the bell peppers and the zucchini and simmer gently. Now, add the rest of the vegetables and a bit more of the vegetable stock. Simmer, covered, for approx 5 minutes. 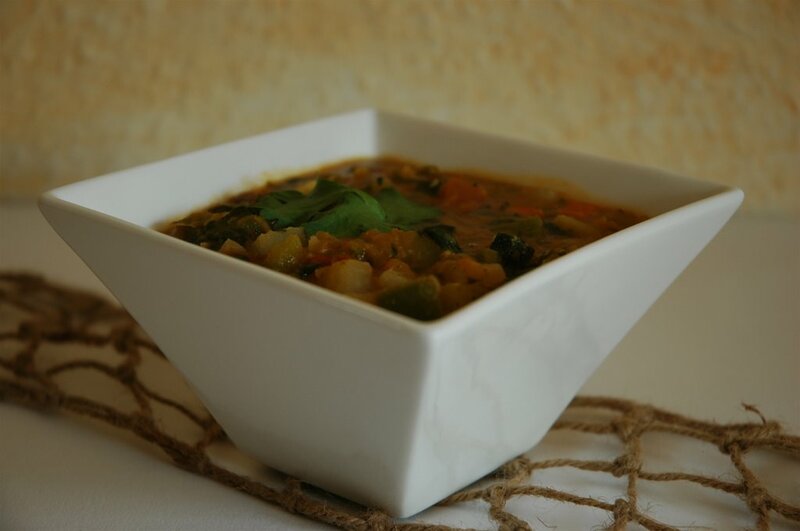 Once the vegetables have blended with the juices of the spices add the lentil spinach mixture, which should be a creamy texture, to the wok. Allow all the ingredients blend together. Verdict: I served this with a wild rice / basmati rice mixture. I was not too sure how Soeren would take to the spices used here but apparently it must have tasted great. He did not put his spoon sown once, just shoveled spoon after spoon till his plate was empty. After that he sat back and just smiled with that satisfying look! Tom is always delighted when I decide to make Indian dishes. So, he was excited when he took a peak into the wok when he came home. "Another blog event?" he asked to which I sheepishly nodded. He smiled and said "Never knew blogging would spoil me so much! Mexican one day, Indian the next, what's on for tomorrow?" I looked at him and winked "Just wait and see ... tomorrow is a surprise!" That goes for you folks too, Wednesday I have a little surprise in store for you ... see you then! PS. Don't forget the Monthly Mingle's theme. A few early birds have already entered their recipe so I am looking forward to those who still are interested in taking part. mmm, nice picture. Lentil soup? I am not thinking about what you made at the moment! Just blown by your beautiful arrangement girl! Lemme see- you made lentil cakes? Lentil pancakes? Lentil sweetmeat? Some more gr8 pics there, Meeta. Making friends through blogging is so exciting. I never knew that all this would happen once I entered the blogosphere. And to think that I didn't know until December'05 that food-blogging existed. I was looking for a red lentil recipe and stumbled across your blog. I love it! I'm going to try this one, and the Cinco de Mayo peppers. Great job. Keep on cooking! Love your post - glad you had fun with the twist! Okay, at the risk of sounding like an idiot, what is kohlrabi? Thanks! I'll see if I can track some down, 'cause this looks darn yummy! Teriffic! I've had not much success ever making dhal. Yours looks very good. Thanks everyone. I hope you all will send me your verdicts if and when you make it!